This beautiful villa with south facing heated pool comes highly recommended. It is located in a quiet but central location with easy access to all local amenities including the Baku water park, beautiful sandy beaches, the old town and harbour areas. 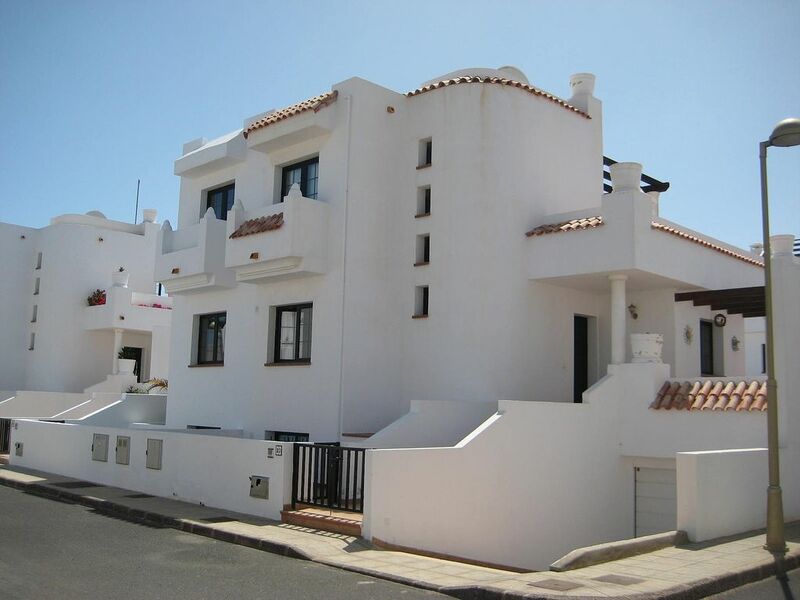 2 minutes walk away is the El Campanario Canarian village style commercial centre with excellent shopping, weekly craft markets, traditional Canarian entertainment including restaurants and bars.The property is laid out over 3 floors and is ideal for families and friends who like to share but still want individual private areas. The pool is heated in the winter months to maintain a comfortable temperature throughout the year. Bathroom on each of the 3 floors. Bathrooms 1 and 2 complete with bath, overhead shower, wc, wash basin and bidet. Bathroom 3 as above without bidet. All bathrooms fully tiled and are fitted with mirrors, spotlights and shelving. The kitchen is fully fitted with granite work surfaces. Equipped with oven, ceramic hob, dishwasher, fridge, microwave, toaster and kettle. There is a breakfast bar with granite top and seating around. full size course is located near the airport. Notes on accommodation: The size and layout of the house makes it ideal for the larger family or 2 families sharing. The property has a private heated pool for sole use of our guests. There is a TV fitted in all bedrooms with DVD player and a selection of DVDs for your entertainment. Please note that this property has a strict a non smoking policy but you are welcome to smoke responsibly in the outside areas. High chairs,cots and bedding are available at no additional cost. A complimentary welcome pack will be available on your arrival. Outside: There are steps leading to the front door and alfresco dining area with pergola. This terrace also leads down to the pool/lounge area which is south facing with all day sunshine. The pool is heated/cooled and fitted with a safety cover which also retains the pool temperature overnight. The top terrace is accessed via the double French doors on the top floor with wicker furniture and sun loungers. Utility Room: The utility is fitted with a washing machine, iron/ironing board and clothes airer. mop, bucket and sweeping brush are also stored here. Cleaning / Towels / Linen / Maid service: Bedding towels and linen are supplied (no beach towels). Cleaning is carried out prior to arrival. Clients may request additional clean at an extra charge. Other: Top sun terrace with wicker chairs, table and sun loungers. Dining terrace next to the kitchen with hardwood table and chairs ideal for alfresco dining. The pool area is part tiled/wooden decking with sun loungers, table and chairs. Fabulous holiday rental. 3 couples and all enjoyed the villa and space it offered. Fabulous holiday rental. 3 couples and all enjoyed the villa and space it offered. All facilities excellent. The different places to sit and relax outside were all good. The pool was fantastic. The men were able to watch the world cup matches so a bonus. Some would have liked WiFi but a plus was people were not on phones all the time. Thoroughly enjoyed. Thank you. Beautiful Villa which was spotlessly cleaned, everything you could possibly need provided even a welcome bottle of wine and snacks on arrival. Pool and terrace area lovely. Location excellent short walk in to town. Communication with owners was good and any issues sorted quickly. bus stop about 300 yards from the house. The airport is about 38 kilometres away and will take about 40 minutes in the car or taxi which will cost approx 40 euro. is easy around the island with good roads and clear signs. Corralejo is situated on the northern tip of the island almost surrounded by the Atlantic Ocean, which makes the water sports on the island world renowned. On the other side of the town is the national park with the magnificent dunes and beaches which will match anything in Europe. The quaint old town and harbour offers all types of fishing, boat and jet-ski hire and is within a 20 minute walk from the house either along the beach or main street. entertainment. The cuisine ranges from traditional English to Moroccan, Indian, Italian and of course Canarian and Tapas. Booking Notes: In the first instance please contact Lesley Clifford via the link below. Changeover Day: Changeover days can be flexible but please contact Lesley to discuss. Notes on prices: Prices are for the property per week in UK Pounds. The prices shown are normally based on 6 people Midweek clean is available upon request. Linen changes are also available upon request. A charge for these services will be quoted to you upon request and charged separately.